Elvis arriving at JFK airport. Just amazing how handsome he looks almost every time . I agree it don't matter what he wore it looks great on the guy. Some people have al that luck, charme and greatness. But i wish the picture was taken in amsterdam man for his europe-tour!!! yes i have a dream!! He should have been playing New York City again instead of the suburbs of Long Island. How cool he was with those neck rings! He looked great too! Thanks a million Paul. I remember this photo very well. It first appeared in "The Star" magazine. Elvis, had been flown in to Kennedy Airport.. for his 2 concerts at the Nassau Coliseum (Uniondale, Long Island, New York) which were on July 19th 1975. As a kid, I had the opportunity to attend the 2 shows on the 19th. And I must tell you, he looked Great and sounded Great !!! And he was very "playful" with the audience. The press, made mention of his weight gain.. but said, his shows were good ! I believe, the afternoon concert, was the only show, ever, that Elvis performed the song "You'll Never walk alone" and it gave us, in the audience chills !!! And It was the first time, I had heard him do "Big Boss Man" Live in Concert (since then its been featured on many Concert recordings from 1974 & 1975). I also liked the way he did "The Wonder of you" among many. The 1975 Long Island shows are such a "great" memory for me. Beautiful picture of the man no one but Elvis could wear a choker and chain and make it look good with the outfit. Is that *really* 1975? Wow...! I'd guess 72! WOW... he looks so absolutely fantastic in this photo... Man... Simply gorgeus !! 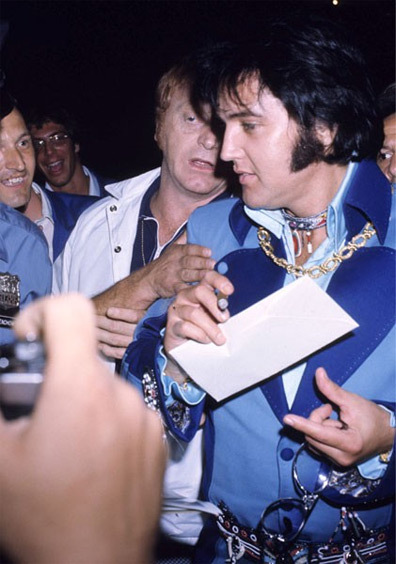 Thanks - he does look great in this photo - thanks to ElvisNews.com for posting it. great photograph, Paul. By the way, what was enclosed in the enveloppe? Well, this proofs he could wear ANYthing and still look gorgeous :-) I love the smell of those cigars!